For a sample of some of our white collar crime results, click on the following case summaries to read a detailed description of each case. Perhaps no other area of criminal defense seems as exciting or glamorous as defending a person or persons accused of white collar crime. The offenses at issue can range from embezzlement (Penal Code § 487a, 503, 504), forgery (Penal Code §§ 470 and 484(i)), check kiting (Penal Code § 476a(a)), receiving stolen property (Penal Code § 496), tax fraud, RICO actions (Racketeer Influenced and Corrupt Organizations Act), identity theft (Penal Code § 530.5), money laundering (Penal Code § 186.9), copyright infringement actions, Internet fraud (Penal Code § 502(c)), bribery, Medicare fraud (Penal Code § 550) and extortion (Penal Code §§ 518 and 520) to much simpler actions such as those described in the above summaries involving code compliance, licensing, labeling, social security fraud and credit card fraud (Penal Code § 484e). The cases we have handled have been very small and simple to other large cases that took years to ultimately resolve.The cases can involve gigantic file contents involving over twenty bankers boxes of documents.Having a dedicated paralegal just to keep the files organized in a logical manner can be critical. These cases often require experts in accounting, computer forensics, hand writing analysis or banking law and thus can quickly become extremely expensive. The cases can also involve parallel federal criminal prosecution that is not barred under principles of double jeopardy as many may presume, as well as complex civil litigation (misrepresentation, unfair competition, conversion, unjust enrichment, injunctive relief and declaratory relief), probate proceeding and pending bankruptcy litigation.It is imperative that any attorney handling such cases has a firm grasp on issues personal and subject matter jurisdiction, summary judgment and discovery issues. The specific intent element in many such cases is often elusive, but established through circumstantial evidence, especially when there is a pattern of activity.Such a pattern of conduct involved in embezzlement and fraud cases case expose the client to aggravated white collar crime enhancement penalties that involve a minimum of two years to a maximum of five years additional prison time when the value of the theft exceeds $500,000 (Penal Code §§ 186.11 to 186.12). What we have found is that a thorough investigation early on, usually with the assistance of a private investigator or several such investigators, is extremely important.If the client suspects he or she is under investigation, we can prevent the client from giving an incriminating statement to the police or provide one under controlled limits. Our past experience in similar cases does help in knowing what is needed, but just being able to listen to the client is often more critical.It is not always as simple as merely getting recorded statements from bookkeepers, accountants and other key employees.Sometimes, a creative solution is what works. 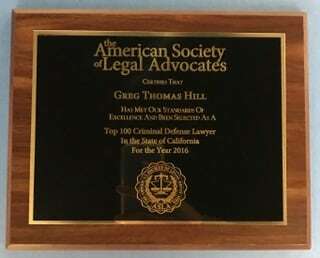 Unlike many criminal defense attorneys, Greg has a Masters in Business Administration and valuable experience in large Multi-District Litigation in federal court.He has extensive experience from many years in taking depositions and handling cases that involve over 300 victims in a single case. Many such cases can surprisingly be charged as a felony or a misdemeanor (a “wobbler”).When the case is a small misdemeanor, Greg Hill & Associates always considers a motion for civil compromise (Penal Code §§ 1377 and 1378) or when it is a rather low value felony, a motion to reclassify the case as a misdemeanor (Penal Code § 17(b)).